AMERICAN PLANNING ASSOCIATION is a Chicago-based, nonprofit, public interest, and research organization representing 30,000 practicing planners, officials, and citizens involved with urban and rural planning issues. FREDERICK R. STEINER is the Dean of the School of Architecture, The University of Texas at Austin. 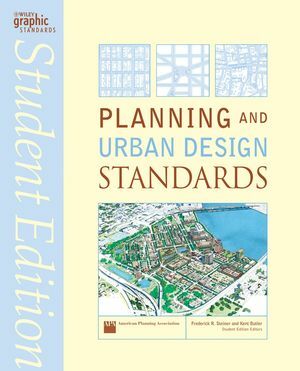 He is on the advisory boards for Planning and Urban Design Standards and Landscape Architecture Graphic Standards (both from Wiley). KENT BUTLER is Associate Dean of Research and Chair of the planning program at the School of Architecture, The University of Texas at Austin. Part 1: PLANS AND PLAN MAKING. Critical and Sensitive Areas Plans. Part 2: ENVIRONMENTAL PLANNING AND MANAGEMENT. Habitat Patches, Corridors, and Matrix. Hierarchy of Streets and Roads. Street Networks and Street Connectivity. Part 4: PLACES AND PLACEMAKING. Leadership in Energy and Environmental Design—LEED. Economic Base and Econometric Projections. Parks, Recreation, and Open-Space Needs Assessment. Aerial Photographs and Digital Orthophoto Quadrangles. U.S. Geological Survey Topographic Maps. Property Maps in Modern Cadastres. Census Data and Demographic Mapping. Remote Sensing and Satellite Image Classification. Property Rights, Police Power, Nuisance, and Vested Rights. Due Process and Equal Protection. Freedom of Religion and Expression. Innovations in Local Zoning Regulations. Adequate Public Facilities and Concurrency Management. Transfer and Purchase of Development Rights. Land Evaluation and Site Assessment. ECONOMIC AND REAL ESTATE DEVELOPMENT. Financial Planning and Analysis:The Pro Forma. Graphic Symbols and Drawing Annotations.